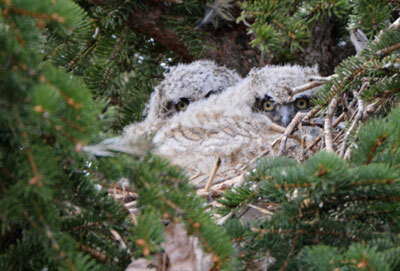 Checked on the owls this morning.. still trying to keep warm. Mamma wasn’t there, she must be out hunting. This female Mallard Duck really can’t make up her mind where she wants to nest. She was on top of the dog house this morning! Notice we had a dusting of snow last nite! April showers is supposed to bring May flowers, not April snow! It could be that your mallard is looking for her eggs. If she does nest and lay eggs, will the owls or hawks grab her or her eggs? 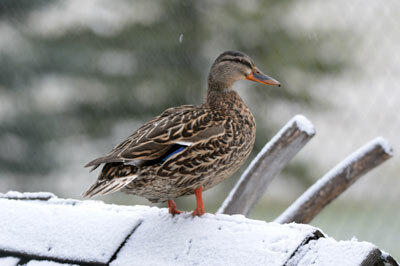 Have you ever had ducks lay eggs on your property before? Once a Mallard is disturbed from her nest, she usually abandons it. Mallards always nest on our property. Last year they nested between the garage doors underneath the bush but unfortunately an animal attacked her eggs. We had one under the bush under the living room window and that one was successful. She had 9 babies and we were lucky enough to see her leave (see ducks page for photos).